Painting by Antonio del Pollaido : Apollo and Daphne. 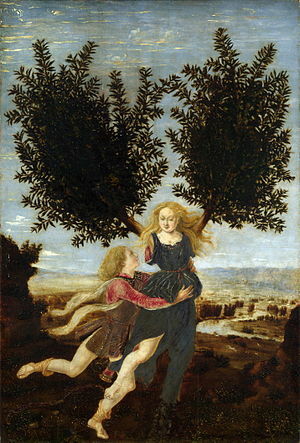 This painting at the very moment of Daphne’s metamorphosis into a laurel tree. Daphne, a leafy ‘victim’ of Apollo’s desperate infatuation. 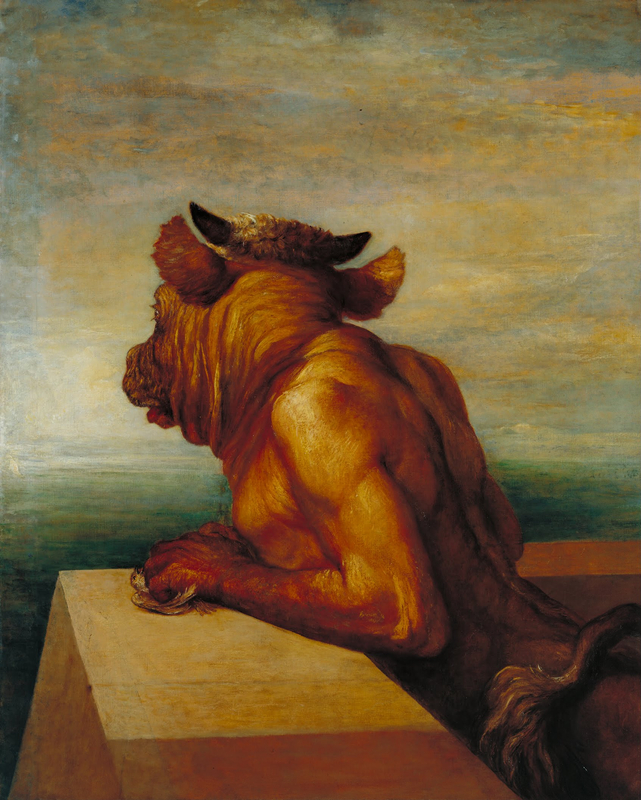 The final example of word study integrated with our unit on mythological heroes comes from two students, Luciana and Liam , who researched ‘victimization’ in connection with The Odyssey and Perseus. Their chosen method to illustrate their understandings of the word and its its connection to Perseus and The Odyssey was in stop-motion animation, a time consuming but ultimately rewarding and successful process for both students. What a great visual demonstration of the integration of word study and literature. Thankyou everyone for the supportive comments to the previous post. Students are thrilled their work is being looked at and appreciated. 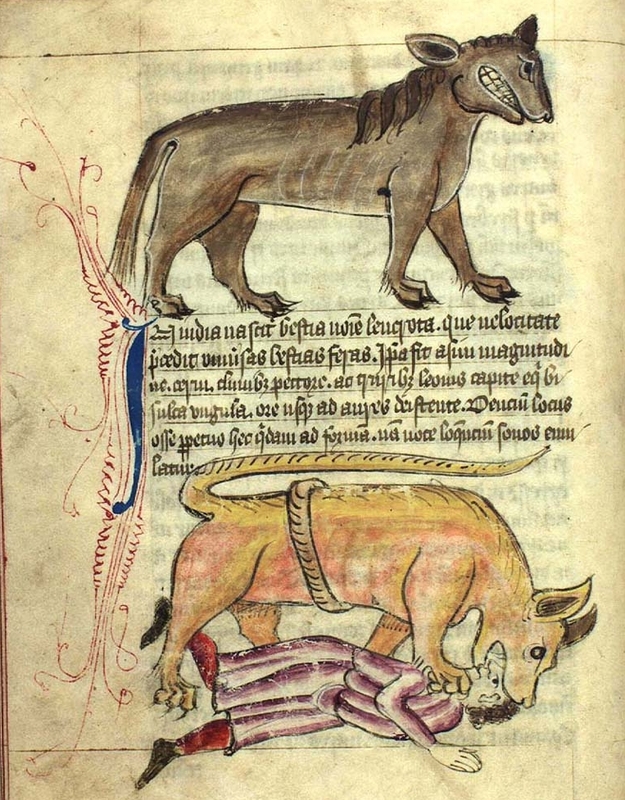 A few more ‘Plain English’ style clips to share: loyal, malicious and arrogant. Some students are beginning to understand the concept of a ‘stem’. They had realized of all the related words to ‘loyal’ the suffix –al was present and they felt this was a suffix that made the word an adjective. When other suffixes were added onto this stem they noted the word class changed: <–ty> made the word a noun, as did <–ness>. We are still speculating as to whether this is a free base element as in <loyal> or as the group has proposed as <loy+al>. The group working with <arrogant> showed their understanding of how the root, Latin rogare: to question, to demand, influences the base and the <malicious> group (who are far from this in attitude and disposition) of the connection to words such as malevolent. In the course of the planning, this group discussed how <mal(e)> is often regarded as a suffix yet they felt that the existence of <malice> proves otherwise. I had an interesting conversation with the group from the class next door, also working on the same Common Craft project with these words. Several of these students are making connections to their other languages. Two Korean students discussed ‘courage’ and their discovery that the English ‘courage’ came from the Latin root cor :heart. They told me the Korean equivalent of this word revolved around the liver as the seat of bravery. Perhaps this calls for an investigation into other internal organs being used or removed to indicate an attitude or character trait: ‘plucky’,’ guts and gutsy’ and their antonym ‘gutless’ immediately springs to mind, then ‘melancholic’, ‘lily-livered’ (need to investigate the origins of this phrase…arum lilies-death?) and ‘in cold-blood’. Another group, sparked by the words, argued if Odysseus really can be called a hero. One boy passionately dismisses the idea – “He endured and was determined but is that heroic? He killed all the suitors, he didn’t listen to the gods and when told put down his weapon, he was disobedient and just kept on slaughtering.. surely there was another way! It’s definitely not heroic!” Another argued about Perseus – he had so much assistance from the gods with the helmet and winged shoes, not really like Odysseus who was isolated and victimized by Poseidon, and who pretty much had to survive unaided.” Lively, animated discussions, all prompted from a focus on the words. 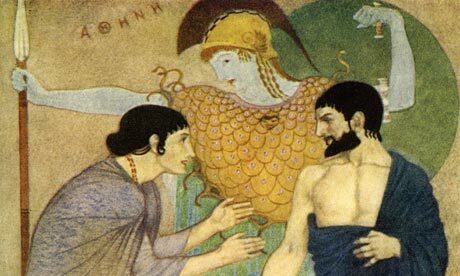 William Russell Flint from a version of The Odyssey, published in 1924, with desperate female perhaps the ever patient Penelope. This week’s focus and sharing of one word has intensified many concepts both in terms of word study and in terms of understanding of characters and heroes from Greek myth. Students are referring effortlessly to etymology, roots, morphology and affixes and base elements- all understand the difference between free and bound, and are using sources such as word searcher, the mini matrix maker, and trusty Online Etymology Dictionary. 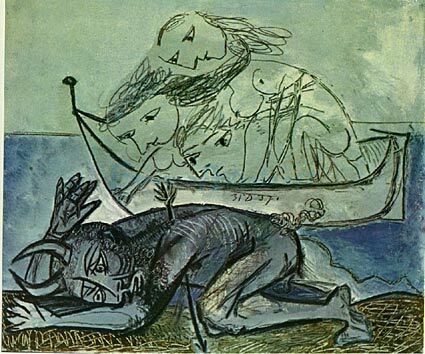 All students are familiar with plot and character from the Odyssey and Perseus. We are examining the role of the hero in class and looking at the commonalities between these Greek hero myths. Students have worked collaboratively- they have had to divide the task into making, in some cases, a host of characters. They have planned what is essential to reveal about the word and how it ties into myths, and practised many times ‘hiring’ others to help where necessary. They scrunch together on the floor huddling around a small sheet of white paper and slide words, morphemes and characters off and onto the paper. The Common Craft genre forces collaboration. Every day students have burst into the room before class to get on with it or worked through lunch in a frenzy to create and make characters, and show how roots bloom into modern English base elements. All students have participated. For those learning English, it has given them a safe place to practise and rehearse. It has opened our eyes to hidden talents within the class- the artists and dramatists. Students have had to negotiate, correct and direct one another and they have all applauded and given positive feedback to each group. With this focus on a word and in bringing it to dramatic life , all have stated that they have a deeper understanding of etymology and morphology. Here is a small sampling: ‘in plain English’ :the chant of the Common Craft explanation videos. We have attempted to work within this genre. The room has felt chaotic in the last few days but there has been a welter of enthusiastic activity. Today we shared our knowledge of morphemes, and reviewed the roots. Students now are about to embark on various ways of sharing their knowledge about The Odyssey through focusing on one word which they feel gets to the heart of conflict, character or theme and produce an imovie on this. At the same time they are comparing this word and myth to that of Perseus. Below Ethan and Ayushi share their excitement about their chosen word and their increasing confidence in the morphemic and etymological realms at this stage of the year. In the meantime, we are at work in any free moment in class analyzing the words and tracing the roots of Unusual Words from Project Twins. More on that later!